The talent at the FIBA U20 European Championship extended to the sidelines where coaches displayed some creative XsOs. The FIBA U20 European Championship is the final national youth competition before players jump to the professional level. It’s a tournament that displays great potential, tremendous skills and unbelievable energy as future stars are made! This was definitely the case in Germany last week. Not only are great players found at the event, but 16 talented coaches, each with their own philosophy of basketball, showcase their style of play on the court with creative #XsOs. Who knows – maybe some of these young play-callers will be future EuroLeague or EuroCup coaches? It is a great chance to learn new and fresh ideas, and I learned a ton from watching them coach their teams. Though it was difficult to narrow it down to just six, the following my favorite sets from the FIBA U20 European Championship. The young Israel team shocked the field, and Europe, for the second time in a row: Last year, the team took 2nd place as it lost in the final; this year it won it all. Israel plays a simple brand of basketball, using short plays and quick hitters to gain any type of advantage it may have. This quick hitter, which they ran as the second possession vs Croatia in the championship game, has two options: 1) A pitch action to create an opportunity for 4 to attack the basket early in transition; 2) 4 does not attack, but hits 2 cutting backdoor from the left wing for an easy basket. 1 pitches to 4. 5 cuts up lane to clear space under basket. 2 sells catching on wing and cuts hard backdoor on empty side. Germany had a strong European campaign this summer, taking 3rd place in the tournament being held on its home soil by showing a strong and clever style of basketball. It was very strong in half court offense, perfectly setting and using every screen on the court making it tough for opposing defenses. Caroline is a term used by Gregg Popovich, and this is a nice set for a shooting guard. When 2 sets a back screen for a 5, x2 has to help and thus will be late on the Leak screen (similar to a flare screen but lower) from 4. This allows 2 to shoot open mid-range jumper, isolate in the mid-post, or create a driving lane to attack the rim. Frame 1: 1 swings ball to 5 who swings to 3. Frame 2: 2 sets a back screen for 5 and then uses a “Leak” screen from 4 to get open. The Head coach of Turkey U20 National Team, Serkan Erdogan, was personally my favorite coach in this tournament. The first time I saw him was the previous year in the U18 European Championship in which he was the head coach of Turkey U18. This time, watching him was like a basketball explosion in my brain! Really great sets and tons of fresh ideas. Here is a set I call DHO Scissor, which I like because it creates an open lane to attack basket for 3, and is tough to defend because of misdirect screen between 2 and 3. Frame 1: 1-2 DHO to initiate play. 5 flashes to elbow and recieves pass from 2. Frame 2: 2 screens for 3, who takes hand off from 5 and penetrates strong to basket. Lithuania had great players, especially guards, who were strong attackers in PNR’s and PNP’s. As such, many of its plays ended with a PNR/PNP. Here is a good set to eliminate aggressive hedging on a high middle PNR. When 5 sets a stagger screen, x5 loses position, which is a great opportunity for 1 to set a Ram screen for 5. After a Ram Screen, x5 cannot play an aggressive hedge on 2-5 Top PNR. So it is a perfect situation for Lithuanian guards to gain an advantage going to the rim uncontested. Frame 1: Play starts from Point Entry (4 pins for 2 and 2 recieves pass from 1). Frame 2: 3 runs baseline stagger of 4 and 5. 5 uses a ram screen from 1 to set a solid middle PNR for 2. 1 clears to open up driving space. Croatia, in my opinion, had the most effective offense of the tournament. Its sets were complex, which was a large advantage for Croatia, as players executed them very well and defense often were confused. 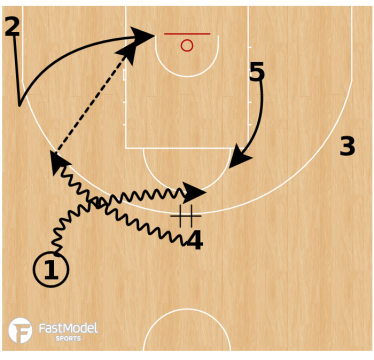 Here is a set which has plenty of movement before flowing into STS (screen-the-screener) action with two options: 1) A Post touch for 4; 2) a down screen for 2. When run to perfection, this set is very hard to defend and take away all options. Frame 1: Play starts with double Iverson cuts by 3 and 4. 4 catches pass from 1 on wing. Frame 2: Pistol action (4 DHO with 3 and then PNR with 5) as 1 and 2 space. Frame 3: STS action with 2 as primary option, 4 in post as secondary option. Which team if not Spain would run Spain PNR action? Here is an effective SLOB set for a strong attacking guard and a big, athletic roller. 5 needs to receive the ball 5-6 feet above the 3-point line, so that when 1 takes the hand off from 5, x1 goes under. This allows the offense to immediately flow into Twist action. This set is hard to defend, because 2 (setting the back screen for 5) sprints from the corner to eliminate extra help. Usually, 2 will be an elite shooter as well in order to draw more attention from the defense to open up the roll – or if not, 2 hits a wide open jumper. Frame 1: 4 clears space as 5 receives pass from 1 and plays Take action with 1. Frame 2: 5 twists into Spain PNR: 1 – ballhandler, 5 – roller, 2 – back screener). Although the FIBA U20 European Championship is not a professional basketball tournament, and players are under 20 years old, there is no denying that the high level of talent from the players. However, we also need to give credit to the coaches that understand how to put them in situations to be successful. Keep an eye on these names as they will surely advance their careers rapidly. Hope you enjoy these sets!